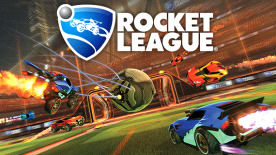 I'm utterly addicted to Rocket League. Part of its undeniable charm is that it's a sports game for people who don't normally play sports games. I, however, am a massive fan of sports games... so really it's just a game for pretty much everyone. Rocket League's accessibility helps to make that a reality – it doesn't matter how good you are at FIFA, whether you're a seasoned gaming veteran or not. The game's tutorials do a good job of teaching you the basics and getting you used to waiting for the perfect opportunity to strike. Rocket League, like many sports titles, is a game of fine margins – close shaves, nail-biting drama, spectacular saves, and ferocious finishes. But because of its pace and player count, those moments are crammed in incredibly tightly to each match's five-minute runtime. There's barely time to catch your breath as matches become end-to-end battles where there's little respite from the heart-stopping action. Add to that some sweet unlocks and plentiful customisation, the ability to replay games and muck about with broadcast cameras and the like, and you can savour your finest moments again and again. Oh, and there's the soundtrack too. I can't get "Firework" out of my head. This title also supports the following languages: Dutch, Brazilian, Japanese and Korean.